We're just back from a three-night trip to Aomori in northern Japan. I'll post more detail later once I've processed the pictures, but very briefly we took the train up, spent two nights in Aomori city, then one night at an onsen in Asamushi. Still cold ­— there was still a bit of snow in shadowy areas — and the cherry tree blossoms are late so we missed that. But still, a great spring trip. We've had a newspaper for as long as I've lived here. But at the end of January we quit our print subscription to the Asahi Shimbun and switched to their digital subscription service. So far the experience has been good. We both like reading the paper, but we don't like the pile of trash it generates every day. Also, we only get one copy, so Ritsuko would read today's paper, while I would bring yesterday's paper with me on the train for reading practice. Not very convenient. And now that I have a Nexus 7 and Ritsuko has an iPad Mini we're no longer tied to a computer for a digital subscription. The subscription is only a little cheaper than the print paper. But the subscription is household-wide, so we can read the paper on multiple tablets and computers, without being restricted to one device or one user. That's much better than the single paper we used to get. 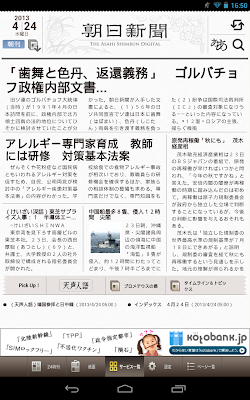 We can now read the morning paper at the same time, Ritsuko at home and me on the train. Also, we get the entire paper. All of it — much more than we got with the print paper. We get the digital morning edition; facsimilies of the Tokyo, Nagoya, Osaka and western Japan printed morning editions; the continuously updated 24-hour paper; the full website; and Be, Globe, Apital, & and other weekly magazine-style content. In fact, there's far more interesting Japanese-language material than I could ever manage to read in a single day. 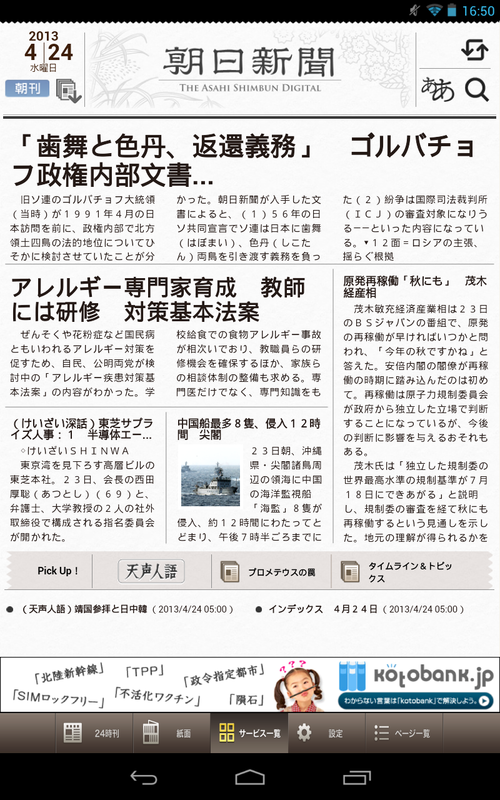 Asahi Shimbun on Nexus 7. Very readable, very convenient. They have apps for IOS and Android. I only have direct experience with the Android tablet app, but the IOS app looks and behaves identically. It's probably a cross-platform application from start to finish. When we got the subscription on February 1st, the app gave you a nice, clean, easy to read presentation of articles, but it was confusingly organized, frustrating to use and very, very buggy. I had to manually kill and restart it every morning, and it didn't let you read anything without a net connection. But the app has been updated a couple of times since then, and the experience is now vastly better. The organization has improved and crashes are now rare. You can download the morning and 24-hour editions to read offline, and all of the editions are available from a single screen. There's still room for improvement. Pictures are low resolution — to save on bandwidth and storage I guess — but graphs become hard to read and you miss out on some good news photography. Resizing text gives you some odd results. There's no subject index so you can't easily find todays editiorials or recipes1. Also, it's cross-platform so it lacks the convenient Android cross-app sharing; you can't select a word and look it up in your own dictionary, for instance. Everything seems to be available online too (Firefox on Linux works fine), though I haven't done an exhaustive inventory. The browser version layout is more confusing, but easier to use for studying Japanese since I get word translation and kanji definitions in my browser. I also find the facsimile of the paper edition (flash-powered, unfortunately) easier to navigate on a larger laptop screen than on the N7. By now I really prefer the digital version to the print paper we used to get. Ritsuko misses the paper sometimes, but for me the digital version is better in almost every way. The paper version did have a few advantages — it doesn't break, doesn't need batteries, can scrapbook articles, and wrap stuff with it — but none that we need very much. Why do we have a paper at all? A whole newspaper really has a lot more, and more thourough, content than the online-only stuff you can find, and it becomes fairly clear once you can compare directly. General news sites really are mostly the wire-service stuff. Interviews, recipes and so on may seem like fluff at a first glance, but it all makes for a much more fun read. I enjoy just browsing through the daily paper in a way I never do with a news site, since I never quite know what I'll find. So I would never consider giving up the newspaper; but neither would I want to return to a printed paper. The newspaper is dead. Long live the newspaper! #1 I sometimes think I'd like to collect specific pages and regular columns into a "mini edition" of my own — but then, I won't leaf though the rest of the paper and miss a lot of good stuff. Probably not a good idea. Here's the most interesting soda I've had in years1. We found it in an antenna shop along Midōsuji street in Osaka this morning, as we were out looking for lunch. Sakurajima — an active volcanic island near Kyūshū — Magma Soda. It's your basic sugary soda — quite good and not too sweet — but spiced with Japanese chilies. It's somewhat spicy, though not so much that it dominates. Flavour as much as heat if you will. No, the interesting thing is that the chili heat combined with the carbon dioxide bubbles really irritate your throat and nose. Not so it hurts or anything, but the moment I took the first sip I burst into a coughing fit. Another sip, another cough. The third sip hit the back of my nose and triggered an impressive sneeze attack. My wife tried a little and started coughing as well. I've never before had so much fun just drinking soda. But, I do understand why they're selling it only in small 200ml bottles, and why they advise you to keep it away from children. Try it, if you happen to come across it. #1 Not that I actually drink much soda, mind you. I loved it when young, but it's usually too sweet for me now. There's a small comment change happening on this blog. Google has (finally!) made it possible to lump together blog comments posted here, and those posted on G+. Why is this good? Because there's sometimes a fairly active discussion on posts happening on G+, but it wasn't visible here. So if the comment fields look a little different from now on, and if there seems to be more comments around here from now on, now you know why. today has been declared "passive voice day" in some quarters. Fun idea, I guess; language games are always entertaining. And since it's Friday morning, let me spend a few minutes about the use of passive while waiting for my coffee. • "Passive voice" is when the recipient or victim of an action is also the subject. The effect is the focus of the sentence, not the cause. It's tricky to get right, and since passive works differently in other languages, non-native speakers of English, like myself, can have a real problem using it. "Somebody opened the window" has the mysterious "somebody" as the focus of interest. "The window was opened" has the effect on the window as focus; we don't care how or why or who did it, but only that this (and not something else) happened to it. • Passive voice can sometimes sound more impartial, but also mealy-mouthed and weasely. The important thing really is if the focus of the sentence matches the content. "Mistakes were made" is a prototypical I-take-responsibility-for-nothing-I-did passive statement. Who is responsible is a major issue, but this puts the focus away from that. The grammar and the content doesn't match. "I got vaccinated" is proper use of passive. What happened to me is important. Who did it — my usual doctor, a nurse at a vaccination center, a medical student temping at a health clinic — doesn't matter. • Many people (me included) frequently get the definition wrong, and believe some sentences that really are not passive is, while some passive sentences are not. "The window is open" is not passive, for example, as there's no change to the state of the window. This may or may not be a problem. If your focus is on grammar or language structure, then it matters a lot, of course. If you don't get your definitions right you can't discuss properly with other linguists or do any systematic data analysis. But if your focus is on practical writing style, then you can treat the term "passive" as a wrong-but-convenient shorthand for grammar that avoids naming the actor or cause. It's good enough for discussing style, and as a bonus you will incense any nearby grammarians, which will be good for their circulation and mental agility. • People like using passive voice in scientific writing. And quite often it is the best way to describe things. "The rats were placed in a water maze." What happens to the rats is the important part; we don't care who did the placing. But researchers — and young researchers especially — sometimes go overboard with this, and express every sentence in the passive. It is, I think, a combination of wanting to sound "professional" and not having the confidence to stand up for your own work. "The data was analysed." is not wrong, but I certainly prefer "We analysed the data." Using "we" as shorthand for "one of more of the people listed as authors" is common and accepted. "That the proposed method is effective and useful is concluded." No. Stop. Don't do this. Any guess, estimation, proposition, conclusion and so on are opinions, and who makes those is part of the semantic focus. You didn't care about who placed the rats above, since it doesn't affect the outcome; you do care about who is drawing conclusions or making guesses. You don't want to find out that it was the lead authors mother or the guy at the hot dog stand around the corner that thought it seemed effective and useful. "We conclude that the proposed method is effective and useful." Stand up and take responsibility — and take the credit for the work. It's worth noting, I think, that the older and more successful a researcher becomes, the more they insert themselves into their papers. Papers by big names frequently use "we" or "I", and can feel very readable and informal, sometimes even a little chatty. If you want to sound like a successful scientist, avoid overusing the passive voice. But do use it; it's sometimes the best way to express an idea, so don't shy away from it. Use it in moderation, but use it. Pisang Tanduk is a cooking banana, a variety of rhino horn plantains. They're starchy and not very sweet when raw so you generally cook them. The Tanduk banana (I guess "tanduk" means horn in Malay) is big. Really big. We found one in a speciality market in Tokyo last month, and it was the length and girth of my forearm. Sorry to say, I didn't think to take a picture of it in time, but it really looks just like a regular — but big — green banana. A Malay grower has a post and a couple of good pictures here. There's not a whole lot of information out there, but it seems that when green you can use it much like potatoes in stews and curries. If you wait until it ripens it'll turn slightly sweet and be good for more snack-like dishes. Ours was still green so we waited. And waited. Aaaand waited. It finally turned yellow this weekend, three weeks after buying it. 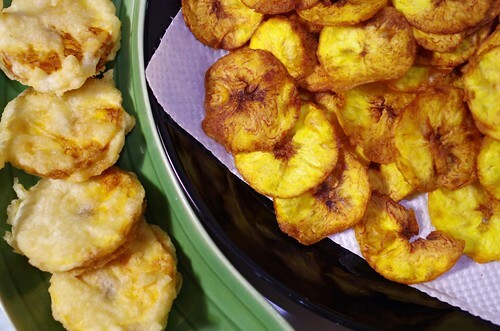 We've never even seen a plantain in our lives, and we really didn't expect anything edible to come from this experiment. We peeled the banana and cut off six chunky slices, about 1.5cm thick, for tempura. Then we thinly sliced the rest (using a cheese slicer) for banana chips. For the chips we heated the frying oil to 170°C and simply dumped the sticky banana slices into it one by one, a dozen per batch. We did try to rinse a few slices in water, then dry them off (you do that for potato chips), but it didn't seem to make any practical difference. When they just started to partially brown we picked them up and dumped another batch into the frying pot. The time is a little tricky; you want them still mostly yellow with a little golden browning, but if you're too quick they'll still be partially soft. Wait a little too long and they'll lose the yellow colour and some of the banana flavour. The tempura was just as easy. Mix up a bit of tempura batter, dip the slices, and dump them in the oil (which we set to 180°). After a few minutes the exposed bits of banana will start to brown nicely while the tempura batter is turning just slightly golden. Left, banana tempura. Right, banana chips. Both turned out really excellent. The chips are crispy but not hard, with just a hint of sweetness and banana flavour. They're nothing like the crunchy, heavy "banana chips" sometimes sold as snacks. They're already tasty from the pot, but toss them with a bit of salt and they turn great. Ritsuko really liked to also add a bit of brown sugar to enhance the sweetness, while I prefer them with just the salt. We ate more of them than we really should have yesterday, and we still have a whole jar full; one banana gives you lots of chips. The tempura was, I think, even better. A very pleasant balance of sweetness, savouriness, and saltiness (dip them in a bit of salt when you eat). The surface is slightly crisp and fluffy while the inside is soft and just a little creamy. There's just enough flavour to give it character and never becomes overpowering. You could make this as part of a tempura dinner, or as a really good side dish with fish or fowl. I suspect it's a little too delicate to mix well with a heavier meat dish, though veal or ham might work nicely. We did this as a one-off experiment, and really thought we'd fail. As it turns out, though, both the chips and the tempura was delicious. We'll certainly make this again when we can. Finding Tanduk bananas in Osaka is difficult of course, but not impossible; if nothing else we can probably order one through a greengrocer. And it's good enough that we should.